Remind her how she caught your eye with our eye catching charm bracelet. 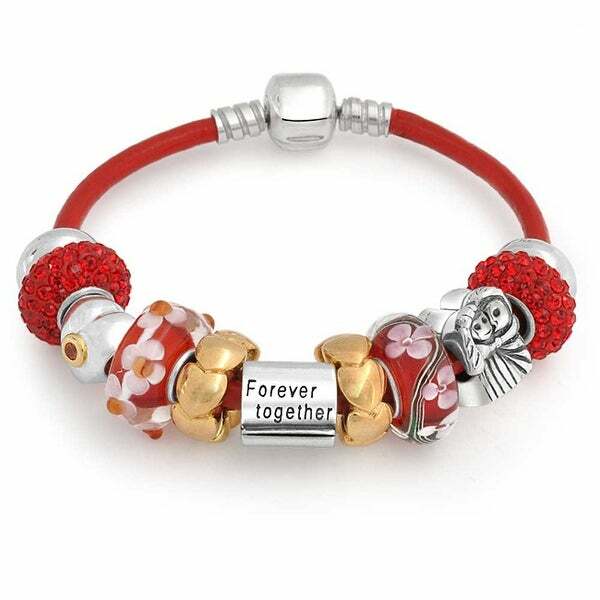 This romantic bracelet comes in the color of love and passion as multi design beads are set on a bright red leather bracelet cord. Our crystal, heart, couple, and flower beads are done in beautiful, complementing shades of reds, pinks, silver, and gold. This bead bracelet makes a perfect present, and can be worn all the time due to its casual design. Try giving one as a Valentines Day gift or anniversary gift or anniversary jewelry. Order this love and heart bracelet today let the centerpiece together forever bead remind her of your promise.